I passed by Shaw almost everyday and when this resto opened last year, the place would be packed with diners even on weekdays. After a couple of months and more branches opening, I finally got to go and try it out. The pizza place's main draw is one can 'Design, Build, Eat' their own pizza. It's not new that you can choose which toppings you want to put on your pizza but what makes Project Pie different is that it makes you feel that you're really part of the process. You have to line up at the counter and go through the assembly line. They also have pre-designed pizzas if you're too boring to create your own. No matter what pizza you design and order, the good sized 12" personal pizza cost Php245. I really admire the how efficient and effective their process is, customizing pizzas for each diner is a challenge. It starts with a machine that flattens a ball of dough then you can choose to have it red or white. Red means having a tomato based sauce spread over the dough and white means plain. Next up is the cheese, the resto has a good variety of cheese to pick from. Gorgonzola, ricotta, feta, parmesan and mozarella. You can pick one or mix and match. Down on the line is the meat, vegetables and herbs station. If you're not sure what toppings would go well with each other, no need to worry because the friendly pizza makers will give suggestion and comments. The last step is waiting for your pizza to be cooked in this huge oven. We had one pre-designed pizza which is a four cheese with pepper, basil, olive oil and garlic. We designed two pizzas but I can't remember exactly which toppings that each pizza contains. pizza's bottom had a beautiful char. But when a raised a slice to put in my mouth, the whole slice droops down. The center of the pizza had a soggy texture and the crunchiness is found towards the outer edge. I was disappointed with how the crust is, I guess this is what a machine pressed dough turns out to be compared to a hand rolled one. What I liked about this place is first, the quality of the ingredients, no doubt its of excellent quality. Second, they don't scrimp on the toppings, they really load it up. Third, the staff is super friendly and knowledgeable, they would even make small talk while you're in line. And last but not the least, it's really fun making your own creation. For the pizza itself, if you're a fan of a classic Italian or New York style pizza like I am, don't expect it to be! Its not! After dining in Corazon, I once again found myself dining in another Chef Florabel's restaurant. 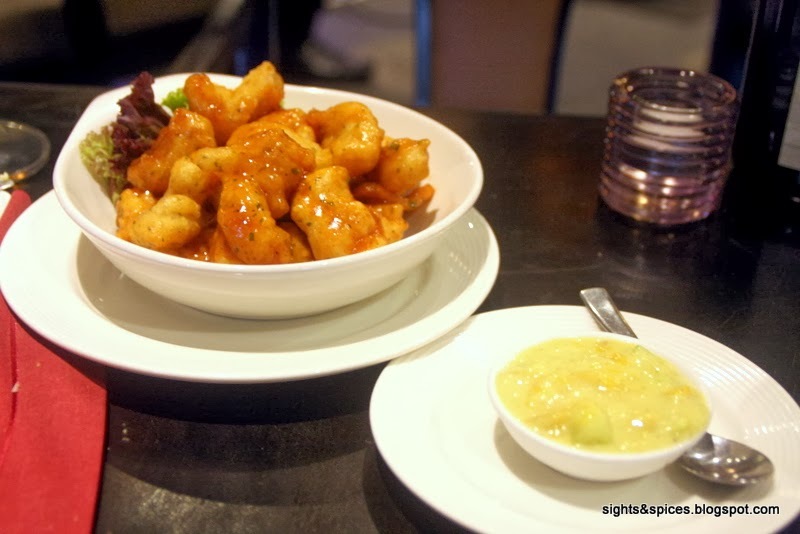 This time around it was Felix, one of the established restos at the Greenbelt 5 strip. As always, I had nothing but high expectations. Complimentary warm dinner rolls and butter was served. We picked a Chillean Carmenere to go with dinner. The Carmen brand was easy to drink as it was light bodied and slightly sweet. We saw a lot of diners ordering this dish so we asked the server what the dish was and ordered one for us. I was so HAPPY that we did. The Gen San is was beautifully plated and served, on the center was the garden salad and around it was what looked like Chinese soup spoons with the Spicy Tuna Concoction inside of it. The garden salad was made up of fresh lettuce, arugula, kiwi, mangoes then soused with a lemon dressing. Simple and so good. The tuna was such a delight, it's an ingenious concoction. Bite-size pieces of raw tuna was mixed with wasabi, rice crispies, spring onions then topped with bits of garlic and black sesame seeds. I love the combination of the flavors and textures of this appetizer. I can come back here just to have this again. The San Fernando consists of prawns doused with kare-kare sauce, fried eggplant and shrimp paste, served with white rice. Nothing really special about this dish, it tasted familiar and usual. I gave them credit for the shrimps, it was fresh and cooked to a juicy perfection. The Valerie would have been a dish that I would rave about, loaded with perfectly cooked prawns, dory, mussels and salmon which had its crispy skin on, it tasted oh so good. But problem is, the dish was supposed to be a risotto. Just by looking at the dish, it was nothing close to being one. The texture of the Arborio rice reminded me of the paella we had in Corazon. For dessert, we ordered the Julia, a chocnut (chocolate peanut) mousse cake. It was pretty good, smooth, creamy, really tasted like chocnut and it wasn't clawing sweet. We wanted to have coffee to go with the dessert, I asked the server what kind of coffee beans they use. Luckily they use one of my ultimate favorite, Illy. Just like with my previous experiences in dining at Chef Florabel's restaurants, the quality the ingredients was excellent and food prepared well. With so many dishes to try out, Felix is one of restaurant that I would want to go back to and try out more. We were looking for a place to dine at the new wing of Shangri-la. Looking at the queue of each restos, one can tell the good from the bad ones. Most of the good restos had long lines, we ended up dining in Corazon which was also full packed that Saturday night. Having dined in one of Chef Florabel's resto before, I had high expectations with Filipino-Hispanic food that the resto serves. There were a few wines on their list, we chose a Spanish red brand blend of Tempranillo and Shiraz to go with our meal. There was a good number of tapas to choose from, we started off with the Coronado or chorizo spring rolls. The spring rolls was served with a side of marinara sauce. Each spring roll was fried to crispy perfection and the marinara dip was a delight. My only gripe about the dish is the chorizo stuffing, I wanted more of it. I was a little bit wary of ordering the Ponce, having fresh oysters will either be a hit or a miss. Luckily the oysters that the resto serves was so fresh. I liked that they gave options for the your preferred sauce, the oyster came with a vinegar-garlic dip, wedges of lemons and a bottle of Tabasco. Normally I wouldn't really order something that I regularly eat at home. But the Sorolla or twice cooked adobo with kesong puti caught our attention I was so curious on how they would incorporate the kesong puti to the adobo. When the dish was served, I was disappointed to see that they just added a few pieces of kesong puti on top. Nonetheless, we still enjoyed the adobo, the soy-vinegar sarsa or sauce was balanced in flavor and I particularly enjoyed how thick it was. The meat is also something to rave about, the chunk of pork was so tender that it melts in your mouth. The server insisted that we tried one of the resto's Paella, we agreed and ordered the Paella Mariscos. The seafood paella consists of aquid, prawns, fish fillet, mussels, octopus, vegetables and egg. The very first thing I take note of when eating paella is the paellera or pan used to cook and serve the paella, it differentiates the good from the great tasting paella. A great tasting paella is cook in a heavy cast iron pan, the slightly burnt toasted rice at the bottom of the iron pan adds aroma and flavor to the dish. Corazon's paella was good, all the ingredients were cooked well and the flavors were spot on. Now, if only they use a real paellera instead of a teflon coated pan, this would have been a great paella instead of being just a good one. I must say that my expectations were met, I'm happy with our dinner. Corazon's quality of ingredients was excellent, familiar dishes was cooked well and tasted like how it should be. A restaurant that worth going back to. Undecided where to dine in Makati, we decided to check out the rows of restaurants in Greenbelt 5. We ended up dining in Zuni, the resto has a decent wine list and the food items on the menu looks pretty good. Moreover we heard a couple of diners saying that Zuni was their favorite restaurant. 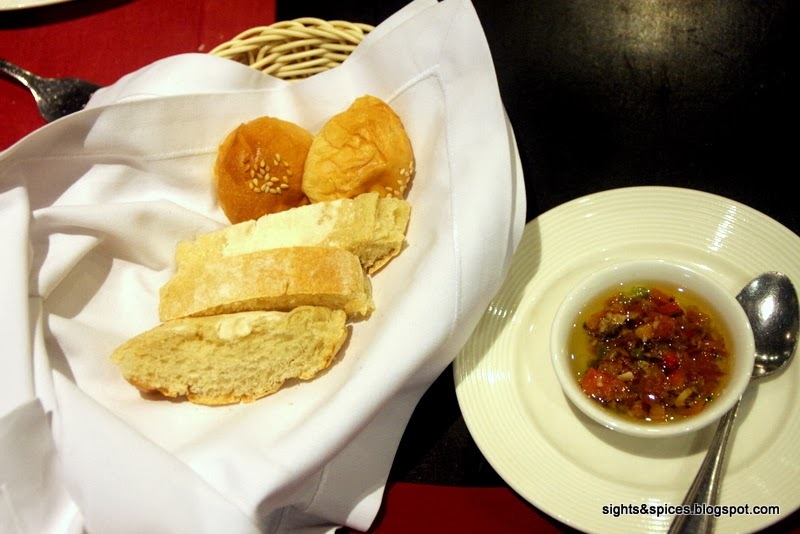 Upon ordering a complimentary basket of warm bread and dip was served. 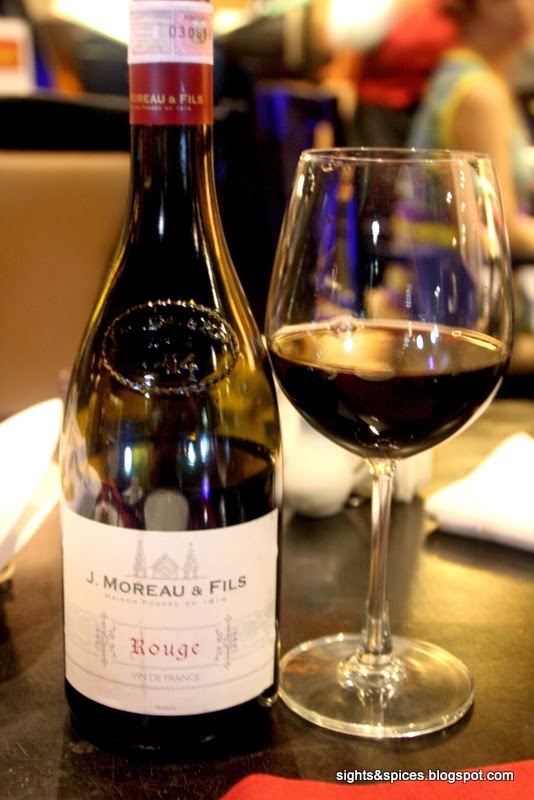 To go with our meal, we had J. Moreau & Fils Rouge wine. A French wine that tasted so so, it tasted like an ordinary table wine. For its quality, the wine was over priced. We started with The Chipotle Shrimp Puff in Avocado-Tzatsiki Salsa. 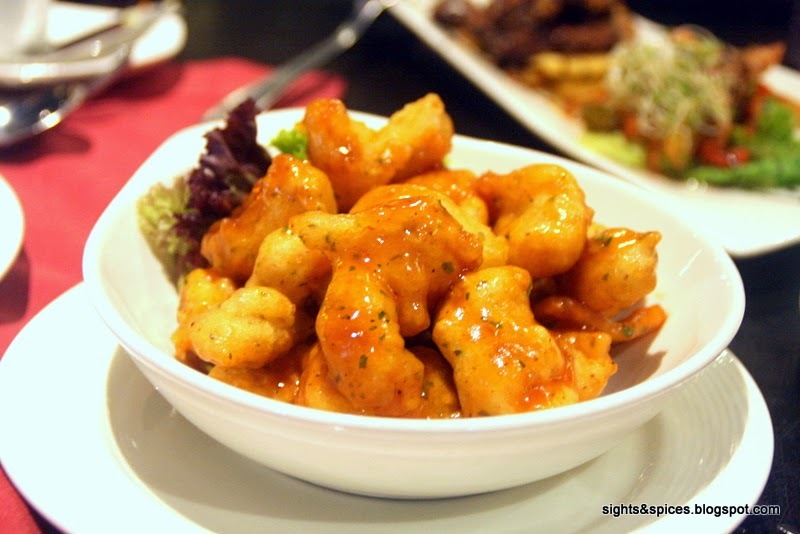 I really enjoyed the shrimp puffs, each piece had a light and crispy batter, inspite of being doused with a sweet chili sauce, the puffs were still crunchy. There were hints of the smokey flavor of Chipotle chillies in the sweet chili sauce but I felt that it wasn't enough. Dipping the shrimp puffs in the avocado-tzatsiki sauce wasn't really necessary but it made it more interesting. I thought it would taste weird, the combination of Chinese, Mexican and Greek flavors may seem odd but it pleasantly works. Everything on the BBQ Octopus would have been good but they forgot to consider the most important component in serving seafood, it's freshness. 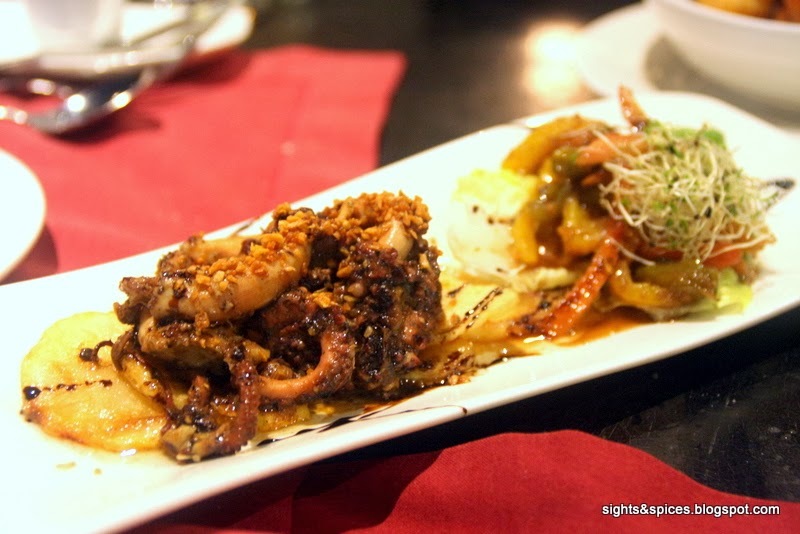 The octopus tentacles had an unpleasant rubbery texture, it was such a waste since I loved the roasted garlic flavor. The Linguini Shrimp Fra Diavolo was pretty good. 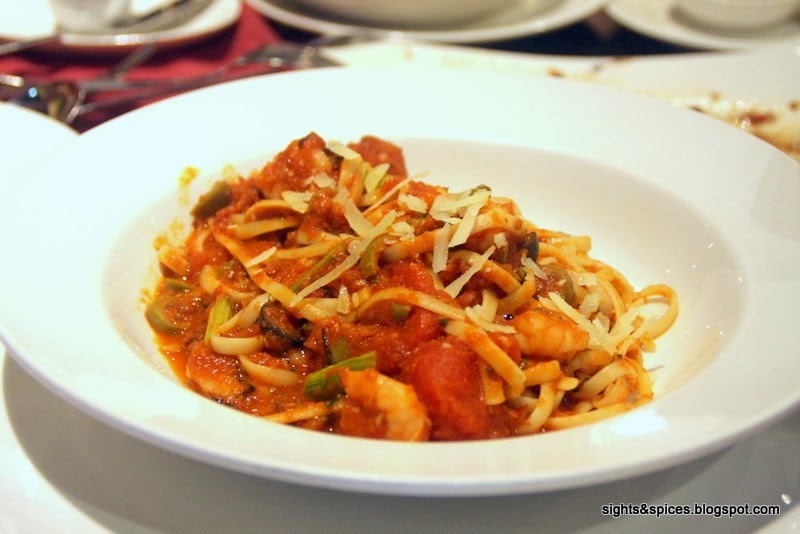 Everything on the plate was cooked really well, pasta was al dente, shrimps were plump and juicy and I enjoyed the chunky garlicky tomato sauce. I just wished that they added more pasta to the dish cause the pasta seems to be drowning in sauce. And they have to add more chillies to it, I barely tasted any spiciness. 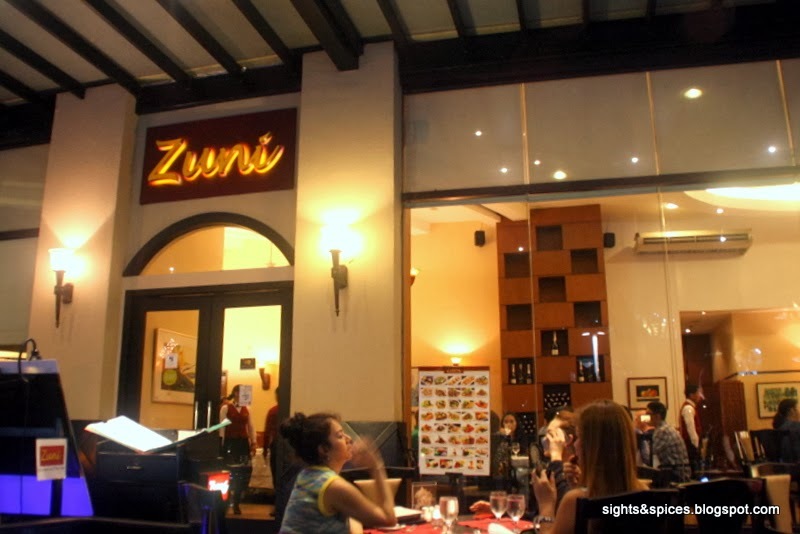 Overall, I enjoyed dining in Zuni, I liked the classy casual ambiance, service was great and food quality was pretty ok. Though I have to admit its not one of the restos I would think of frequenting. If I'll have the chance to go back, I'll ask and order their bestsellers and just maybe I'll have a change of mind.